Microsoft has announced a special online entertainment weekend for the biggest sporting event of the year. Starting Jan. 31, 2008, fans of “Madden NFL 08” on Xbox 360 will be able to participate in online activities including the chance to create your own Madden Bowl with friends, registering for a four-day Play & Win to get exclusive prize packages and the chance to play head to head against NFL stars in a Game with Fame as they hone their skills in preparation for Madden Bowl XIV. To start the weekend off, Xbox LIVE will host Game with Fame sessions allowing Xbox LIVE Gold members to sign into Xbox LIVE at 6:30 p.m. on Thursday, Jan. 31, and win an opportunity to chat and play “Madden NFL 08” against NFL star Patrick Willis of the San Francisco 49ers. They can also sign into Xbox LIVE to chat and play “NFL Tour” cover athlete and NFL star Shawne Merriman of the San Diego Chargers. NFL players will participate in the Game with Fame from Arizona just hours before they go for the win in the Madden Bowl XIV and claim yearlong bragging rights. If you wold be interested in competing with Willis and Merriman you should send a friend request to the Xbox LIVE Gamertags WillisGwF and MerrimanGwF. 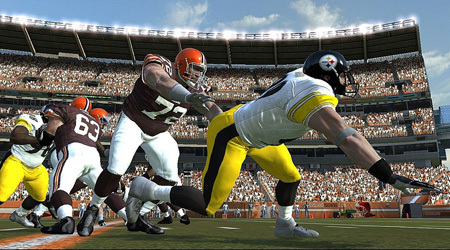 The Madden Bowl is an annual event in which eight current NFL players go head to head in a “Madden NFL 08” on Xbox 360 single-elimination tournament. This year, Madden Bowl XIV will be held at the Martini Ranch in Scottsdale, Ariz., and will feature eight NFL players who will compete for the chance to be deemed the league’s best “Madden NFL 08” player. gamers who register as a Tournament Commissioner on http://www.xbox.com/maddenbowl for a four-day Play & Win Sweepstakes and then play in their tournament on Xbox LIVE will be randomly selected to receive special prize packages, such as an EA Sports 08 Game Pack or a trip for two to New York to be a part of EA Sports’ events during the draft in April. Existing Xbox LIVE Gold members may also register as a Tournament Commissioner online by downloading the exclusive gamerpic.